Mike on the final leg of his Paddy, with Anna and Jamie in support. Picture by Hazel, who was doing all the work as usual. It is a circuit of some 61 miles with 28000’ ascent taking in 47 tops most of which are in the well-known areas of Snowdon, the Carneddau, the Glyderau and the Moelwynion. It’s generally reckoned to be an hour harder than a Bob but Mike got round in 23 hours and 31 minutes, exactly on schedule. He lost half a stone on the way round; according to the pictures and his post-round report, mostly fluid from the brain. Thanks to the stern leadership and fine example of Black Combe’s new captain, the women’s team is winning races all over the place. Anna took first at Wray Caton without even trying. Paula won the Keswick to Barrow only two days after she decided to have a go. Lizzie and Anna were narrowly beaten at Black Combe after Helen Fines got away on the descent, and Sue and Helen came second and third at New Dungeon Gill after triumphantly catching up with that 72 year old who dropped them on the climb. 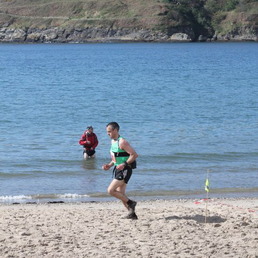 The men haven’t got a prize between them in years but if Harry had turned left at Black Combe he would have been first MU23 by about five minutes, so there is hope for the future. Meanwhile, good luck to Anna this weekend. She’s a sponsored runner in the World Skyrunning Series this summer, starting with the Maratòn Alpina Zegama-Aizkorri in the Pyrenees and taking in the Matterhorn, Mont Blanc and Pikes Peak among others. If you see her in a Basque beret next week, it went well. 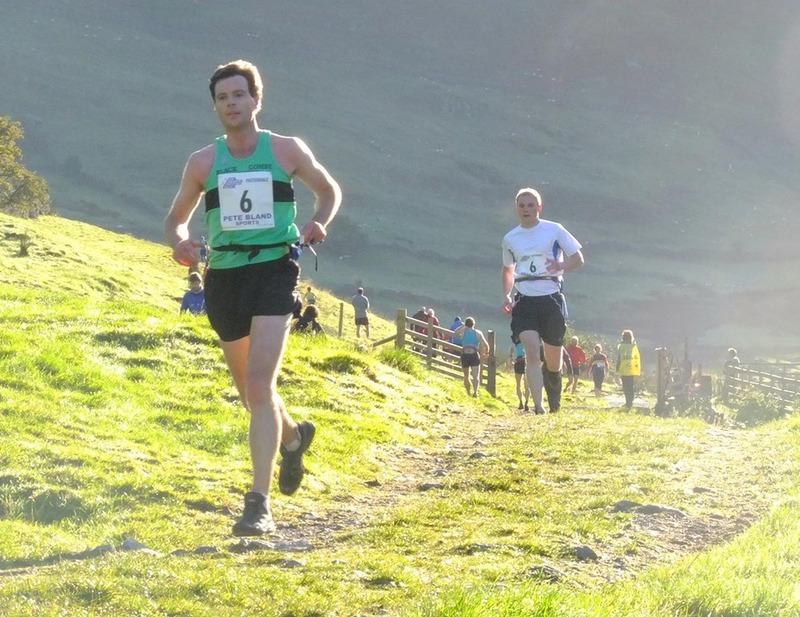 The UKA Fell and Hill relay championships were in Shropshire this year, around the steep-sided valleys and flat heathery tops of the Long Mynd. We had three BCR teams out, and at the end of the first leg our ladies were in third place and the open team 13th overall, ahead of Helm Hill and the Ambleside A team and only three minutes behind Borrowdale. Unfortunately they wouldn’t let Harry and Anna run the other legs too. We struggled on. The courses were fast and grassy (except for the orienteering leg, where you have to follow Pat through seven miles of thigh-deep heather) the sun was out, and most of the time there were at least a dozen of us standing around, gossiping, drinking tea and trying to guess who would come back in the worst condition. For the record, it was me. The rest of the A team put in a good run – Jamie and Pete on the long leg, Mike and Rich orienteering (18th on their leg) and then Rob on the final sprint. The team finished in 36th place, no longer quite so close to Borrowdale but much higher than we have ever placed before. The vets team came in 101st, five places better than last year. The ladies were in 147th and Becky in particular deserves applause: for her first ever fell race she set off up a steep hill in third place in front of a thousand runners. This was our fifth successive UKA relay and it’s a great event; the largest single gathering of fell runners you’ll see all year. It’s well organised, friendly and varied. The venue seems to rotate around the country so we expect next year’s event to be somewhere in Cumbria. Maybe we can manage four teams by then? Rich and Mike finish leg 1 of the first sunny Hodgson anyone can remember. 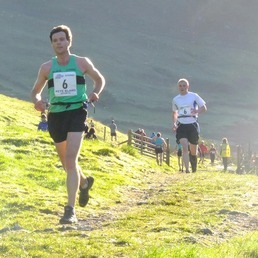 The Black Combe renaissance continues with a striking non-failure at the Hodgson this weekend. Our open team came 19th, thanks to some astute team-building by Mike McIver and very good runs from Mike, Harry, Mike, Rich, Jamie, Tim, Rich and Mike. Harry Stainton and Mike Mc did particularly well to go past 16 other teams and finish 14th on the climbing leg from Hartstop to Sykeside. The Vets team put in a more traditional performance but managed to finish in 50th place despite being two men down (with Pete away and Jamie in the open team). Spectators were disappointed to see that the pairs were quite well-matched throughout and nobody finished in a state of purple collapse, though Dave P, Mike Mc and I were pretty well flogged up the hill by Amanda, Harry and Chris respectively. The cake-off was also to a very high standard this year but I’m going to claim it was won by my magnificently unhealthy lardy cake (main ingredient: lard). Honourable mentions to the lemon cake and the very long banana cake. Parmy was disqualified as usual for pretending that Holly didn’t make it, and a stewards’ enquiry is looking into the unlikely perfection of Rich’s chocolate cake. 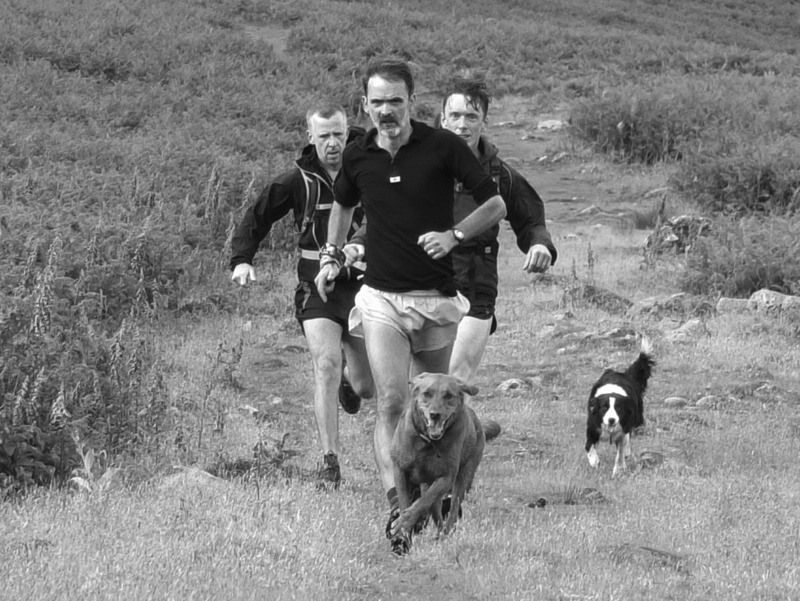 Sadly, this year’s race is going to remembered chiefly for the death of Daz Holloway (of Pennine) on the way over to Fairfield on leg 4. The prize-giving was a rather gloomy affair and we send our best wishes to his family and friends. Pete arrives at Greendale with Pat, Will, Bonnie and Pea. Joss said the dogs were looking good and fit but for some reason didn't mention the people. 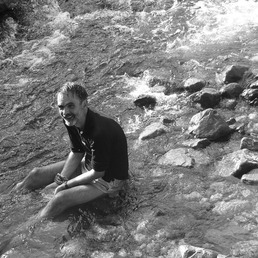 Do you remember when Pete Tayler used to tell everyone how he did the Bob Graham without ever getting his feet wet? Well this weekend gave us four inches of rain, 107 flood warnings, 60mph winds and the day of Pete’s Joss Naylor challenge. The Joss starts in Pooley Bridge, at the top of Ullswater. It follows the High Street ridge down to Thornthwaite Beacon then turns west across the central fells to Greendale, Joss’s house in Nether Wasdale. Altogether that makes 48 miles and 17,000 feet of climb, so about 2/3 of a Bob Graham round. If you’re 50, the challenge is to do it in 12 hours. Despite the pathetic cries of his pacers, Pete refused to wait for a sunnier weekend. At 7 on Sunday morning he set off into a long day of wet rock and driving rain. The conditions made it very hard going and when he got to Styhead many hours later he was exhausted, wobbly and about 40 minutes behind schedule. A large group of schoolchildren drifted away, disappointed to find that he was not the real Joss Naylor. Things looked rather grim. The last leg of the Joss is a glorious run if you have the time or energy to appreciate it: Gable, Kirk, Pillar, Scoat, Steeple, Haycock, then across to Wasdale by way of Seatallan and Middle Fell. Pete didn’t look up all that much, but he was clawing back two minutes here and four minutes there. A claggy detour over Black Crag took a couple of minute away; the secret line off Pillar gave us three back. At the top of Haycock the finish is an hour away. Pete put on his race face, abandoned human speech and somewhere in the tussocks behind Seatallan took ten minutes out of his schedule. With a final sprint down Middle Fell he made it to Greendale in 11 hours, 57 minutes and a few seconds. 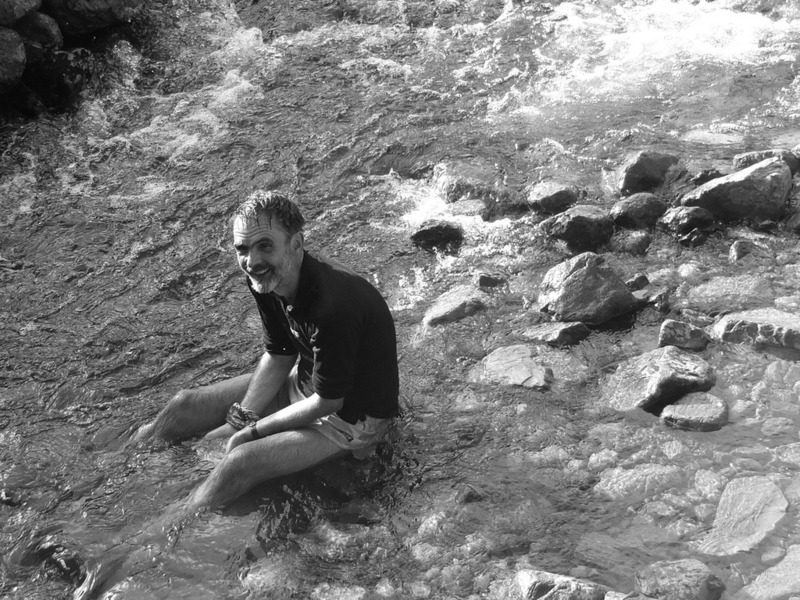 Joss came out to find at him sitting in the river grinning, and said “well done, lad”. Black Combe ladies had a very good day at Causey Pike yesterday. Lizzie Adams put in a superb performance (despite fitting in a hard training run that morning) to finish first lady, in 16th place overall, and take a minute off the course record. Jackie Casey was first lady vet 50 and well ahead of most of the Black Combe men, who spent the day ambling around in midfield admiring the view. 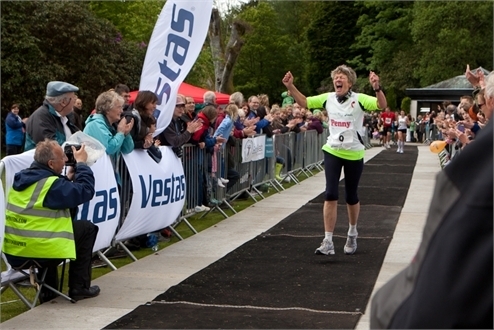 Congratulations to both, and our thanks to Keswick for putting on such a well-organised and lavishly catered race. We’ll all be back next year. Picture thanks to Dobo, and there’s nice coverage on Mud, Sweat and Tears. DSM reaches the top of Fairfield at 6am, about a third of the way into his Bob Graham round. Picture by Sue, who was pacing. Many congratulations to Dave, who kept the recent BCR record of a successful Bob Graham Round each year going by the skin of his teeth. On a hot day Dave lost a few minutes against plan on each of the first three legs, held his own on the fourth and then released a monumental effort on the last to finish in 23 hrs 59!! The usual BCR support was out in force to help, with Pete/Chris/Zoe and the girls on the road and Chris F as chief motivator on leg 5. The focus and effort Dave put in towards the end had to be seen to be believed. What a great day. 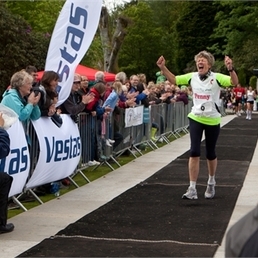 Penny Moreton has completed an amazing 10 marathons in 10 days – all on the same Windermere marathon course – to become the women’s vet 50 record holder for the Brathay 10 in 10. She ran 262 miles with great consistency in a total of 51 hours and 11 minutes, and even speeded up for the last round: her tenth marathon was the quickest of all, in 4:52.52. Penny was running for Hoad Hill but she’s also a Black Combe member and we congratulate her on a superb feat of endurance. Not many people can drink a whole bottle of champagne immediately after running a marathon. You probably remember Easter Saturday for its hot sunshine and gentle breezes, but for some reason on the Isle of Man it was all horizontal sleet, gales and fog. At one point it was so bad that Jamie considered putting his coat on. The Black Combe raiding party was strong again, with four runners in the full event and one in the half. There was top class road support from Hazel and Pete (whose whole leg was still purple from the marathon), and the sun did eventually come out. Jamie and I ran together for most of the day, then he dropped me in the last quarter to finish 24th (of 96) in 6:37. I was 28th in 6:45. Sue was 37th and 3rd lady, in 7:07. Dave Watson was 60th in 8:00 – an excellent performance since I’m sure Dave’s longest race before that was 12 miles – and Claire took 15 minutes off her previous best to finish the half mountain marathon as second LV50 in 3:03. 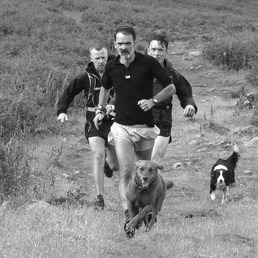 2010 Dunnerdale fell race results are now available. The race and organisation ran very smoothly and 224 completed with only one retiree. The Marshalls and Timers did a great job as usual. Thanks to the competitors for parking carefully and allowing the race to proceed without any hassle for the village. The winners were Lloyd Taggart and Lauren Jeska, and also notable were Melanie Hyder (under 18) who finished 5th lady, Roger Bell 1st MV70 and Alexis Dinsmoor 1st LV60.